Gus: As Chief Cat Officer, I take the safety of our minions students very seriously. That is why I insisted that the Mama put together an emergency disaster kit for National Animal Disaster Preparedness Day. Here in Kansas, we are right in tornado alley. You never know when the worst can happen. Our disaster kit is still a work in progress, but here is what we have so far. A lot of people make a disaster plan for their families, but they don't think about including their furry family members. When we have a tornado warning, the Mama goes down to the basement. Usually, we follow her down there because we want to see what she is doing. If we don't follow her, her backup plan is to lure us down there with some canned food. The Mama plans on putting our disaster kit in the basement along with our vet information. Our carriers are already in the basement so those are ready to go if needed. If you aren't microchipped, it is also a good idea to wear a collar with your contact information just in case you get outside. 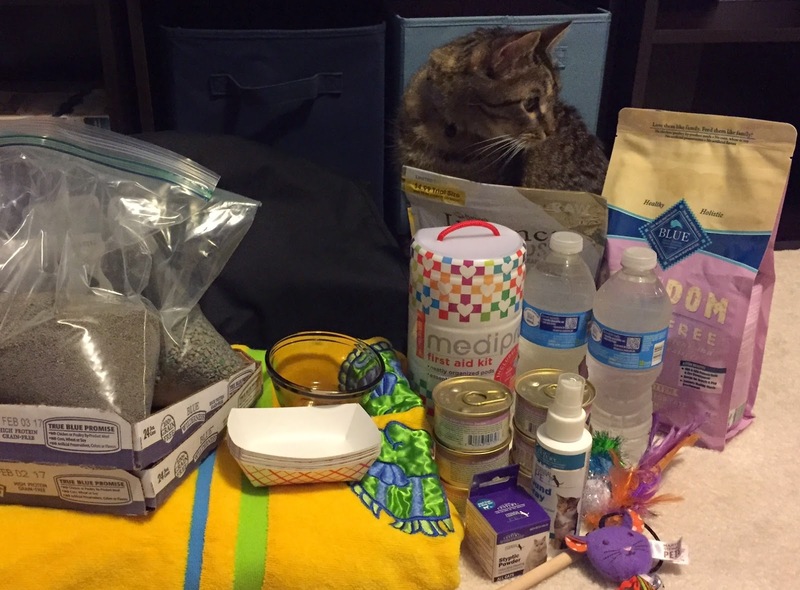 Do you have a cat disaster kit? What items do you have in yours? Great idea with a cat disaster kit! We have earthquakes here, but think tornadoes are SCARY!! We need to get our kit together!! You made us realize our cat disaster plan needs some work! Great post! I have mot of these items, but I need to put them all into one container. Thanks for the reminder.